I have tried all the possible combinations available. The only one that comes out almost satisfactory is the "Reposition". But when I use that the photos are not blended together perfectly and I am unable to fix them. I have been using photoshop for many years and have never had this issue with panoramas. Is it the material? All the photos are the same size and have not been edited prior to attempting photomerge. They came from my Panasonic Lumix DMC FZ100 camera all taken at the same time. The photos are 3240 x 4320 and 4.88 mb. I used SnagIt software to make the sample you are seeing. I could email you the originals if you want to see what happens when you merge them. I just tried the Panorama with TIF files. Same result. 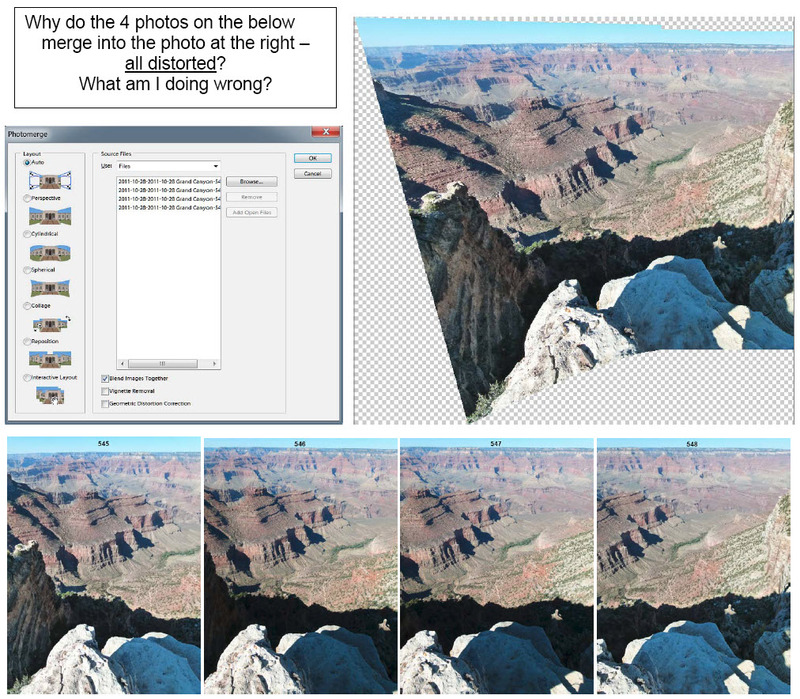 I have used the Repostition method, but as you will notice at the top of the merge you did, the top of the canyon, left to right, is not even/straight. So that gets a fairly good photo, but not as good as I have done in the past.